It was only three weeks ago when Amazon purchased ComiXology, and at the time, it was unknown if Amazon had any plans to change how the comic-selling company was running business. In a sad turn, it looks like Amazon didn’t much care for how the app was handling payments on either Android or iOS. After an update to the application, which took place over the weekend for all users, the ability to make purchases through Google Payments has been removed. 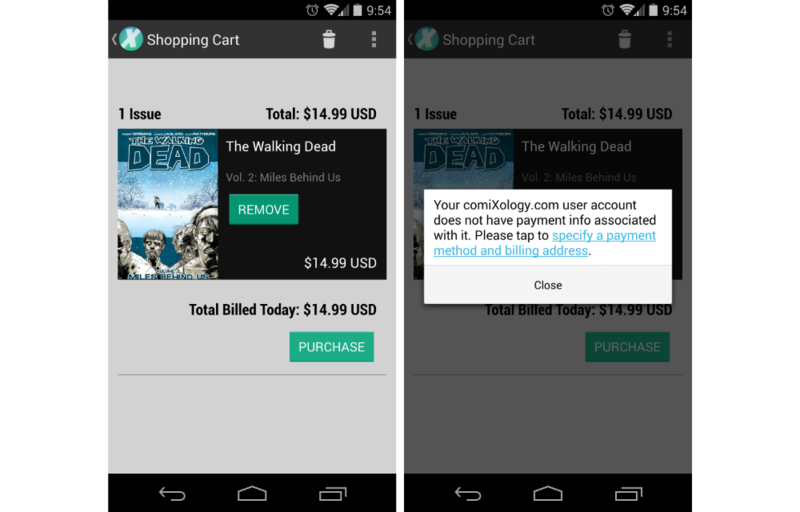 This move forces users to have a credit card associated with their ComiXology account, which they will then use to make payments and buy their comics with through the app’s new Cart feature. The move is only truly hurtful to those users who like all of their online/app purchases to be made through a single account, such as their Google Wallet. With the adding of your credit card info to ComiXology’s servers, it’s just one more thing you have to worry about. While it may only be a minor speed bump for a few users, it is still a sad move to see Amazon shun Android and iOS users who want to purchase comics through the application, regardless of how they want to pay. If you want to keep buying comics through ComiXology, you will need to go update your app through Google Play.